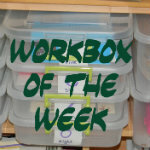 This week's workbox feature can be found over at Confessions of a Homeschooler. I really like these ABC Letter-Picture cards for several reasons. The pictures are colorful and fun. The letters come in both capital and lower case formats. The color of the letter matches the circle it belongs in, allowing for self-correction. The child can work on both letter identification and letter sounds in one box. Work for the Teacher: Buying, copying, laminating, cutting out, the your done!